Oxygen dependent patients should always be tested on their oxygen system at different activity levels sleep, rest, and exercise, as well as at altitude, if possible to ensure the device meets their oxygenation needs at all levels of activity. Proper Oxygen Saturation One objective of an OCD is to ensure that the oxygen delivered to the patient reaches gas exchange units in the lung. Oxygen delivered anytime during the breathing cycle that does not reach a gas exchange unit is considered wasted. The goal for efficient oxygen delivery using a conserving device is proper oxygen saturation or oxygen pressure in the blood for the patient requiring supplemental oxygen at all activity levels. It is important to note that oxygen savings is considered accomplished only after the patient is adequately oxygenated and is a secondary objective for device performance. Ventilation and Perfusion Issues A patient respiratory physiology is a very dynamic process. Even if a conserving device is providing consistent oxygen delivery, results can vary for an individual patient from moment to moment, and also between groups of patients using similar devices. This issue, combined with the wide variety of performance differences in OCDs, often makes it a difficult challenge for patients to consistently maintain proper oxygenation across various portable oxygen systems. Activity Levels Several variables may affect a patient oxygenation while using an oxygen delivery system. Increased respiratory rate will shorten respiratory time and may reduce the amount of oxygen a patient will receive. In the past, an exercise prescription was written for patients whose increase in respiratory rate with exercise required more oxygen to maintain proper saturation levels. This increase in flow rate was to compensate for a shorter respiratory time due to the faster respiratory rate. The general rule of thumb was to double the patient flow rate (e.g. from 2 LPM to 4 LPM) during exercise. Any change in respiratory rate or pattern may affect the patient oxygenation. The lack of attention to this variable in the past has created the misperception that conserving devices do not oxygenate effectively. Oxygen dependent patients should be tested on their oxygen system at different activity levels reflecting real life conditions, including at rest, during exercise, while sleeping, and at altitude, where possible. This protocol has been recommended by respiratory clinicians for years, yet still has not hit the mainstream of patient care. A titration test is the standard method of measuring patients oxygen needs with exercise. It is a simple method that only requires an oximeter and a place to exercise. If a patient will be doing more strenuous activity, every attempt should be made to simulate that activity to see if the device properly oxygenates the user. Sleeping with an OCD is possible, yet an overnight oximetry test is strongly recommended to determine if the device is triggering with each breath and maintaining patient oxygen saturation. Altitude Altitude has an impact on the pressure of oxygen and not necessarily the amount of oxygen. Oxygen conserving devices will give approximately the same volume of oxygen at higher altitudes (or in an airplane), but the pressure differences at different altitudes may have an impact on oxygenation levels. It is important to understand that if an oxygen system is able to meet a patient oxygen needs at a lower altitude, it is possible that that same system may not be able to meet the patient needs at a higher altitude. Unfortunately, it is generally unfeasible to test patients on their oxygen systems at pressures that they would be experiencing at varying altitudes. In general, the common practice has been to double the device delivery setting when the patient is at altitude. However, if the oxygen system the patient is using is already running at its top setting at a lower altitude, another system should be considered for use at higher altitudes. Equivalency When OCDs first entered the LTOT market, they were revolutionary, not evolutionary. A revolutionary product has no predecessor; therefore, there is nothing to compare the product with. For OCD manufacturers to be able to enter the market and sell their products, OCDs needed a reference point that could be understood by the persons using the device. 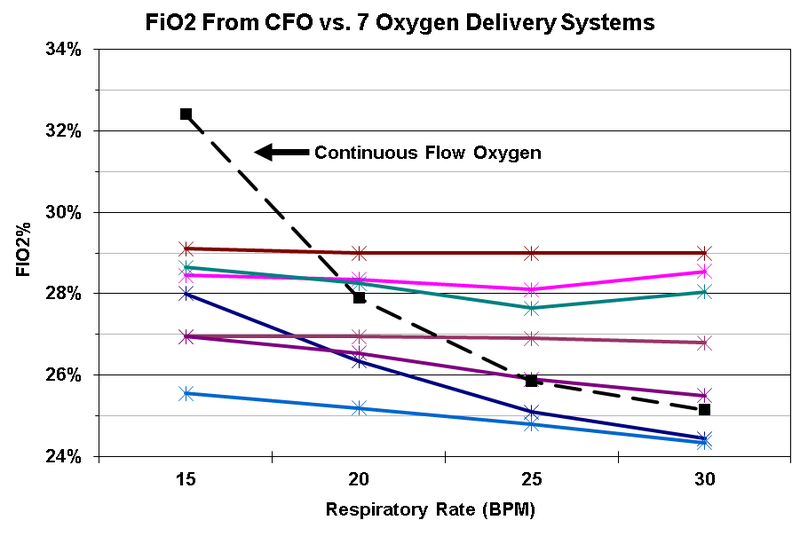 Continuous Flow Oxygen (CFO) delivery was the gold standard in oxygen therapy up to this point, so an attempt was made to compare the effectiveness and delivery of the OCD to the CFO gold standard. Intermittent flow devices such as OCDs deliver a certain volume of gas with each sensed patient breath. A patient breathing on a continuous flow device receives a variable volume of gas dependent on their breathing profile. By selecting one breathing pattern and one breath rate, a delivered dose volume of oxygen can be made equivalent to the volume taken in during continuous flow of oxygen. As a result, manufacturers selected a volume of oxygen for a given device setting that they felt would be equivalent to continuous flow and made that the flow setting on their device. However, this concept only works if the patient never changes their breathing pattern. Obviously that is not the case in real life. Most OCDs have a number on the selector dial and, even though they may claim to deliver oxygen equivalently to continuous flow at that same setting, they typically are not equivalent to CFO, let alone any other conserving device at that setting. The graph shown here displays the delivered FIO2 values for seven conserving devices, all of which are set at the device setting of 2. As can be seen, there is a wide range in delivered FIO2, and no device could be considered to have delivered therapy equivalent to CFO.